There are so many things in the technology world that takes up so much space on computers. Video editing is getting very big with the average consumer, and MP3's are bigger then ever. But what happens when you just run out of space on your PC? One solution is to get an internal hard drive. Or, you can go with an external drive. What's the difference between the two? Well, the internal drive is usually cheaper and performs better. An external hard drive, however, is much easier to use, and is perfect for people on the go. It all depends on the person on which drive to go with. This leads me to the Maxtor 5000DV 200GB external hard drive. Maxtor's had the 5000DV series on the market for quite some time now, but it released the 200GB 7200RPM model very recently, which is the drive we are looking at today. Besides its huge hard drive and fast speed, it features a USB 2.0 or FireWire connection, an 8MB cache buffer (just 2MB for the 120MB version), as well as a Maxtor-exclusive OneTouch button. I'll get into that later. 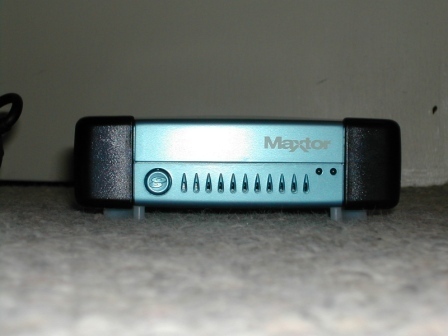 So, what did I think of the powerful and spacious Maxtor 5000DV external hard drive? Read on.